The civil calendar said it was May 19, 2013, and the Jewish calendar said it was the 10th day of Sivan in 5773, but in spirit it was still May 9, 1945, the day when Nazi Germany surrendered to the Red Army of the Soviet Union. Ever since, the veterans of that army and the people they saved have marked it as Victory Day. Here at the Chabad Russian Immigrant Program and Synagogue, the commemoration has taken place annually since 1991, and it has proceeded with the particular emotional tangle felt by Jewish soldiers of the Red Army. They defeated Hitler, but they did so on behalf of a nation whose own anti-Semitism led millions of its Jews to flee once they were able. Where nearly 600 Jewish veterans had gathered when Rabbi Estulin started the annual ceremony, now only about a dozen remained alive and healthy enough to attend. The oldest veteran, now 99, could not get there. Some of the men who did had trouble remembering their exact ages. The medals they wore, though, told the story of their valor. They brandished decorations for “Defense of Leningrad,” “Liberation of Warsaw,” “Capture of Berlin.” With their Old World accents and their Americanized grandchildren, in a country parochially focused on its own “Greatest Generation,” the Russian Jewish veterans embodied a history in danger of disappearing. Rabbi Estulin, 66, understood such truth firsthand. His father, Zalman, had lost a leg from shrapnel at Stalingrad. While the elder Estulin was raising Naftali near Moscow after the war, he spoke less often about his combat experience than about the way he had kept tefillin with him at the front, putting on the ritual leather straps every morning. He spoke, too, of being in a military hospital during Passover, and trading the leavened bread he could not eat for enough sugar to last the holiday. Through the back-channel efforts of the Lubavitcher rebbe, Menachem Mendel Schneerson, the Estulins emigrated to Israel in 1968. While Naftali’s parents remained there, he went on to Chabad’s world headquarters in Brooklyn. 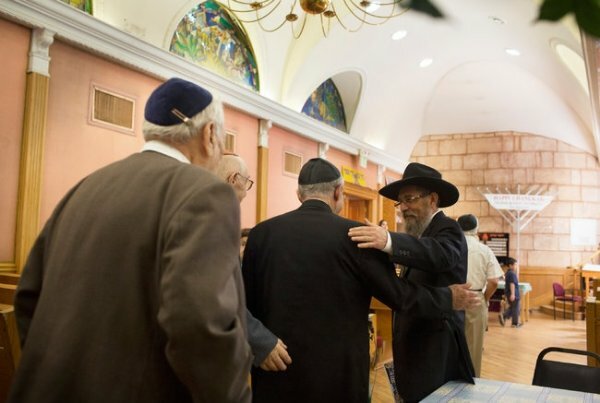 Once ordained, Rabbi Estulin was dispatched to the Los Angeles area, where tens of thousands of Russian Jews began settling in the early 1970s. “My job was to do whatever is necessary,” Rabbi Estulin said. “I have to see what is missing and do it.” He found the refugees inexpensive apartments in West Hollywood. He lined up jobs. He installed a medical clinic in the synagogue’s community center, brought in social workers. He opened a summer day camp and a senior citizens’ program. And, being a rabbi, he infused Judaism into the lives of Jews who had been raised without it. Rabbi Estulin presided over religious weddings for couples with only civil marriages in the Soviet Union; the first groom was a Red Army veteran with a crippled arm from the war. Rabbi Estulin gave both a circumcision and a bar mitzvah to the same 72-year-old man. “Wholesale,” he noted. As a second wave of Russian Jews arrived in the early 1990s with the dissolution of the Soviet Union, Rabbi Estulin began the Victory Day event. It, too, played a role in restoring religious identity and practice. The living veterans were able to tell their stories, have their courage reified. The dead — the 200,000 Jewish soldiers killed in battle or in prisoner-of-war camps by the Germans, according to the Yad Vashem museum in Jerusalem — were remembered with the funeral prayer, “El Malei Rahamim,” and with the recitation of Kaddish. During this year’s ceremony in West Hollywood, Abram Volfson recalled joining a band of partisans, and ultimately the Red Army, after seeing German troops shoot down his mother and sister in the street. He was wounded five times. Yefim Stolyarsky, who served for 30 years in the Red Army, told of not being permitted to hand out medals to his men because he was a Jew. Then there was the Russian canard about how all the Jews, a bunch of cowards, had hidden from the war in Central Asia. “A lot of people try to hide the truth,” Mr. Stolyarsky said as he clutched a prayer book. “Our group knows the truth.” Rabbi Estulin wanted to reassure the remaining veterans that the truth would not vanish from the earth when they did. The proof of Jewish continuity was right in the Chabad building, where the sound of morning play could be heard.